Dalrymple Maitland, Speaker of the of Keys, died at his residence, Brook Mooar, Union Mills, early in the morning of Tuesday, Mar. 25th. For about three weeks Mr Maitland had suffered from acute bronchitis, and his condition grew so serious towards the end of last week that grave fears were entertained for his recovery. Eventually congestion the lungs set in, and notwithstanding the most careful medical treatment and nursing, the malady proved fatal. During his illness, Mr Maitland was attended by Dr Pantin, with whom Dr Hamilton was in consultation. Everything possible was done with a view to arrest the disease, but nowithstanding the cheerful and courageous fashion in which the sufferer bore himself, medical science was helpless in face of the complications which attended upon the last days, and the relatives, though they hoped for the best, were quite prepared for the worst. When it became known on Tuesday that Mr Maitland had passed away there was widespread grief in the Island. For practically his whole life, the Speaker had been intimately associated with the welfare of the Island, and it is not too much to say that for the twenty-five years preceding his death, he was the most prominent as he was decidedly the most respected of the Island's public men. In everything Manx he took a warm interest, and with him no sacrifice was too great and no work was too arduous which :had for object the advancement of the country of his adoption and its people. By nature a plain and unassuming man, he nevertheless did his utmost to promote social life in its best sense among his country-folk. He was geniality personified, and through his tastes led him to prefer a quiet pipe and a book after the labours of the day were over, he was ever ready to lend a helping hand in innocent festivities. With him commercial ,instinct was strongly developed in honourable fashion, and perhaps his most useful work was in connection with the encouragement of the material prosperity of his Island home. Mr Maitland was admirably dutiful as a politician, but though he attained to the highest political honours which it was in the power of Manx people to bestow, he never ready engaged in the somewhat stormy arena with that keenness and ardour which marks many public men  his engagement in the science of statecraft was prompted rather by a sense of what he owed to the community than by .inclination. All the same this conscientious performance of the duties attendant upon the part he bore do the Councils of the Manx-nation were of very great advantage to the people.He was democratic in his tendencies, yet he was an ardent believer in moderation and conciliation, and he brought these qualities to bear with remarkable success throughout his political career. It is not to be wondered at, then, that Mr Maitland secured for himself a warm place in the esteem and affection of the people of the Isle of Man. His influence was great and was always exerted with a single purpose-that of making his fellows happy and prosperous. That he succeeded in this, his main object in life, is demonstrated by the lamentation which has attended upon his death. Like many other men who have achieved celebrity and success in the Isle of Man, Mr Maitland was not a Manxman by birth. He was by blood Scottish, and by birth English, he having first seen the light of day some 71 years ago in Liverpool. His father was the late Mr John Maitland, for many years editor and principal proprietor of the " Liverpool Mercury," one of the most influential daily newspapers published in the British Islands. Mr John Maitland was a power in British journalism in his day. He guided the destinies of his great newspaper with a skill and energy and constant regard for the public weal which gained for him the approval and respect of all those whose approval and respect are best worth having, and he is still remembered honourably in literary and journalistic circles. Mr Dalrymple Maitland's mother was a daughter of the late Mr James Dalrymple, who in his day conducted an extensive and flourishing cloth factory and corn mill at the Union Mills, Braddan-the business, in fact, gave the name to the locality. Mr James Dalrymple was a Scot who united that shrewdness, which is one of the principal characteristics of natives of North Britain, with a kindly heart and a desire to further the welfare of his adopted country. For many years he was one of the leaders in Manx public life, and he succeeded in winning the love and esteem of Manx people. He died about sixty years ago, and his memory has kept green by the handsome memorial chapel which was erected by public subscription after his death at the Union Mills. The chapel is connected with the Congregational body, of which. Mr Dalrymple Maitland body, an enthusiastic member. He was succeeded in the conduct of the Union Mills by his son, the late Mr William Dalrymple, uncle to the late Mr Maitland. Mr William Dalrymple was even more closely associated with Manx affairs than his father. For over a quarter of a century he was one of the representatives of Middle Sheading in the House of Keys, and in other directions he rendered important public service. Especially did be take an active part in connection with the Isle of Man Steam Packet Company, of which famous institution he was for a long time chairman. Thus though Mr Dalrymple Maitland was not a native Manxman, he, by reason of his forbears' association with the Island, was Manx in heart. He was too, Manx bred in the main. While still a boy, he came to the Isle of Man and resided at the Union Mills with his maternal uncle, Mr William Dalrymple. He was educated at Dr Steele's renowned school, situate in those days on the Crescent, in Douglas, though on the complete destruction of the premises, by fire in the 'sixties, it was transferred to Strathallan Hallthe building which was subsequently used as the Isle of Man Industrial Home for Orphan and Destitute Children. On completion of his education, Mr Dalrymple Maitland entered his uncle's business at the Union Mills, and ultimately succeeded to the concern. Simultaneously he filled the office of sub postmaster at the Union Mills, a position which he retained until he sold his milling and weaving business in 1890. The sale of his business was inspired by a desire to devote more of his time to commercial undertakings with which he became connected on the death of his uncle. He had been appointed to fill vacancies caused by Mr Dalrymple's decease upon the directorates of the Isle of Man Steam Packet Company and the Isle of Man Banking Company, and about the same time 1890 he was elected as one of the representatives in the House of Keys for Middle Sheading. He retained his seat in the House until his death, being returned at each general election in the interval. Though he never obtruded himself in connection with parliaments discussion, he, when he considered the occasion fitting, addressed the House, and his speeches were invariably marked by shrewdness, common-sense, and wise suggestion. As a member of committees of the House and Tynwald Court and of boards appointed by Tynwald, he made his mark, his talent for administration being evident. He was appointed chairman of the Isle of Man Asylums Board and the Assessment Board, and presided in connection with the work of these important bodies to the end of his days with a sagacity and tact which secured for him the gratitude of the Island. In 1899 he was appointed a director of the Isle of Man Railway Company in succession to the late Sir John Goldie-Taubman. Sneaker of the House of Keys, and in 1907 he became chairman of the directorate on the retirement of Sir John Denison Pender, K.C.M.G, Previouslyin 1894 he had been chosen to succeed the late Samuel Harris, High-Bailiff of Douglas, as chairman of the Isle of Man Banking Company, It is worthy of note that the position has only been occupied by three gentlemen since the bank was founded 54 years agothe late Mr William Collister, of Thornhill (grandfather of Mr D. Clucas), who held the position for seven years; Mr Samuel Harris (22 years) and Mr Maitland (25 years). In 1900 the late Mr J. A. Mylrea resigned the chairmanship of the Isle of Man Steam Packet Company, and Mr Maitland was appointed as his successor in that office. Energetic and conscientious in everything he undertook, Mr Maitland was especially devoted to his duties as head of the great carrying concern. Indeed, with him the Steam Packet Company amounted almost to an obsession, and he cheerfully devoted time and ability to the affairs of the institution. In large measure his death may be attributed to this devotion. He felt keenly the proposal to nationalise or reconstruct the Company put forward at the annual meeting held just over a month ago. That materialisation of the project would result in prejudice and injury to the Island he so loved he was convinced, and he accordingly opposed the movement in strenuous and determined fashion. So wholehearted was his opposition that tremendous mental strain was involved in giving it effect, and there can be no doubt but that his arduous efforts had a very detrimental effect upon his health. He presided at the meeting with his customary fairness and tact, but it was observed that he appeared somewhat haggard, and while he expressed himself vigorously, though courteously, he undoubtedly was not his usual good form, and it was probably his sense of patriotism that carried him through a very trying ordeal. In the end he triumphed over the protagonists of what was described as the "wrecking policy," the " carry on " policy which he advocated being approved on a poll by a big majority, the shareholders refusing the blandishments and pecunary advantages put forward by the other side. The almost unanimous feeling of the Isle of Man was with Mr Maitland in the attitude he took up, and this feeling was warmly expressed in many quarters. At a sitting of the House of Keys, held a few days after the Steam Packet Company meeting, a resolution conveying the thanks of the House to him in connection with the stand he had maintained was passed, and he was otherwise warmly congratulated. It says much for Mr Maitland's tact that owing to his conciliatory suggestions the dissension which had prevailed upon the company's directorate with respect to the proposal was entirely healed. Having emerged victoriously from the great struggle, Mr Maitland brightened up considerably. Only three after its conclusion, he in his capacity of chairman of trustees of the Isle of Man Bank for Savings presided at the annual meeting of that institution, and he was in excellent spirits. Alluding to the fact that the meeting was attended by exactly the same people as had been present at the 1918 meeting, he congratulated them all upon this evidence of sound constitutions, and humorously expressed the hope that they would all survive to support him when he presided in 1920. Within a month of thus declaring himself, he was dead! Those who were with him on the occasion will be pardoned if they sincerely exclaim " Absit omen." He was to have presided at the annual meeting of the Isle of Man Railway Company on the following Tuesday, but the day before the meeting was held he was seized with illness, and under his doctor's orders he had to take to his bed. He did not, however, conceive that his illness was serious of character, and in a letter read at the meeting he, in apologising for his absence, hoped that he would soon be about again. The crowning honour of Mr Maitland's career came in 1909, when he was unanimously chosen by the House of Keys as Speaker of the House in succession to the late Mr Arthur Moore. C.V.O. After the general election of 1913, hbe was rain elected as Speaker, and again the House was unanimous. He has fulfilled the important duties of First Commoner of the Isle of Man in painstaking fashion and with complete success. He was most impartial in his conduct of the debates, and ever displayed a close knowledge of the standing orders and procedure of the House. Added to this, he was constantly courteous and considerate. By the members he was held in the greatest admiration and respect, and they ever bowed cheer-fully to this rulings. As has been said, he was not what may be called an eloquent man, but he in his rulings expressed himself clearly and with commendable conciseness. He was jealous of the dignity and privileges of the House, and never hesitated to champion them when he conceived they were threatened or otherwise endangered. On these occasions he "stood up" fearlessly to the Imperial authorities and to the Governor and Council, and he usually had the best of the resultant exchanges. In this respect, too, he was well served by his genius for moderation and conciliation, his prudent attitude frequently avoiding what might have been a deadlock had some counsels prevailed. Generally progressive, he had no sympathy with extremists. He accomplished with great success the difficult task of steering a middle course, with general acceptance to and advantage of the Island. He was a firm advocate of Constitutional Reform, and his evidence before the Home Office Departmental Committee on the question bad a considerable influence in bringing about the committee's report favourable to the movement. Such democratic measures as Income Tax, Old Age Pensions, Workmen's Compensation, and widening of the suffrage, found in him a firm supporter, and generally he was favourable to the social and political aspirations of the masses. Representing a constituency which had a large agricultural element, he did his best to promote the interests of land cultivation, but when agricultural questions came on in the Legislature, he invariably preferred the general good to the benefit of a section of the community. Almost a lifelong member of the Isle of Man Agricultural Society, he some years ago acted as president of the society for twelve months. The late Mr Maitland was the oldest member in point of service of the Manx magistracy, he having received his commission as Justice of the Peace in 1892. In 1909 he was appointed to the Captaincy of Marown ; while he was also a member of the Local Government Board. As an extensive proprietor in the company owning the " Liverpool Daily Post and Mercury," he was a member of the board of directors, his appointment dating from the formation of the company. Among other public offices or quasi-public offices held by him in the Isle of Man may mentioned the vice-chairmanship of the Naval and Military War Pensions Commssion and membership of the Insular Commission of the National Relief (Prince of Wales) Fund. He had the somewhat melancoly distinction of being the last of the Baume trustees, he having survived all the other trustees  ,a, somewhat large body  appointed under the will of Pierre Henri Joseph Baume, an eccentric Frenchman, who resided on the South Quay, Douglas, and who bequeathed all such estate as he had power to devise in trust for charitable and educational purposes in the Isle of Man. Baume died just over forty years ago, and it is only the other day that Mr Maitland, in his capacity of surviving trustee, succeeded in disposing of practically the last of the estate. By the provisions of the Statute of Mortmain, the bequest of such of Baume's real property as was situate in England, for charitable purposes, was rendered void; but the acute old French man had foreseen this possibility, and had provided against it by devising the English property to the persons named as trustees for their own personal use, he having confidence that in the hands of the devisees the estate would eventually be applied to objects of charity. His confidence was not misplaced, as in course of time the trustees  or rather the devisees  handed over the proceeds of realisation to Manx educational charitable institutions. Among these was the Isle of Man Industrial Home for Orphan and Destitute Children, in which the late Mr Maitland took a very warm and practical interest from the time of its. foundation fifty years ago. Another charitable trust of which Mr Maitland was member was the Henry Bloom Noble trust. He was not one of the trustees instituted under Mr Noble's will, but was co-opted by the other trustees on the death of Mr Alexander Hill. Mr Maitland was also connected with the Douglas and District Needlework Guild, and with the Manx Music Festival Committee and the Douglas Choral Union, in fact, there was hardly a Manx institution which had for object the uplifting of the people with which he was not actively associated. His religious sympathies were wide and practical. All bodies which laboured for the advancement of Christianity found in him a warm friend, but he was particularly associated with the Congregationalists. From the time Finch Hill Church as erected-in 1868-he was a church member, and was one of the senior office bearers in connection with the church. Support of the Dalrymple Memorial Church at the Union Mills was due to his individual benefactions, and to those of this niece, Miss Woodhead. Mr Maitland, by the way, erected a church-room adjoining the Memorial Church by way of commemorating the late Mr William Dalrymple, his uncle, who was in this day the most prominent and active Congregationalist in the Isle of Man. 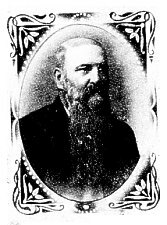 Mr Maitland married in 1879 Miss Frances Caley, only daughter of the late Mr Charles Caley, a prominent merchant in Douglas, and sister to, the late Mr Andrew Caley, who was for many years a member of the Douglas Town Council. Mrs Maitland died shortly after giving birth to the only child of the marriage a son. This son, who was the apple of father's eye, died on the field of honour while serving King and country in France, on February 21st, 1916, and, less to say, the consequent blow was felt by the father very acutely. Lieut. Dalrymple Maitland, almost immediately on the outbreak of war, joined the army, and received a commission in the Duke of Wellington's Regiment, He soon proceeded to the Western Front on active service, and was killed while gallantly fighting for the right. He was a gentleman of much charm of manner and of considerable talent, particularly in the direction of music. Mr Maitland, though he deeply mourned the loss of his boy, bore the bereavement bravely, but there is little doubt that it contributed in large degree to his end. His niece, Miss Woodhead, was also deeply grieved by the cutting off in the flower of his early manhood of Lieut. Maitland, to whom she was affectionately attached, she having mothered him from early infancy. After Mrs Maitland's death, Miss Woodhead took charge of Mr Maitland's household at Brook Mooar, and was of considerable aid to him in connection with the social duties connected with his public life. During the war she has been especially prominent in her association. with the Douglas and District Needlework Guild and other, war charities. Physically, Mr Maitland was an uncommonly fine man. He was more than passing tall, and had a great frame, denoting unusual strength of body. His features were well-marked, and a long and handsome beard  in his prime it was ruddy of colour  lent dignity to his general appearance. He had the saving grace of humour well developed, and either told or listened to a good story with much pleasant unction. Probably he was at his best when he felt in irresponsible mood  at such times he was wont to " let himself go," much to this own and other people's enjoyment. ' As a chairman at social gatherings he was ideal, and though the many calls connected with his graver public duties left him but little time for the lighter side of life, he made the most of such opportunities for relaxation as came to him. He was a member of the National Liberal Club (London), the Junior Reform Club , (Liverpool), and the Ellen Vannin Club (Douglas). Altogether, he rendered the State much service in the course of a remarkably wall-spent life. Not only did he secure the confidence and respect of all sections of the Manx people, but he gained for himself the devoted friendship of all those with whom he came into intimate contact. He was a man of firm convictions, great charity of thought, of high ideal of duty, and of fervent and practically expressed patriotism. The Island is verily the poorer by his loss! SITTINGS OF THE LEGISLATURE ADJOURNED. The Legislative Council and the House of Keys were to have held sittings on Tuesday, but on learning the news of Mr Maitland's death, both bodies decided to adjourn without transaction of business by way of marking their souse of the public loss. At the Legislative Council there were present the Lieutenant-Governor (Lord Raglan), Deemster Moore, Deemster Callow, the Attorney-General, the Vicar-General, the Receiver-General, and the Archdeacon. The Clerk to the Council (Mr B. E. Sargeaunt) was in attendance. The Lieut.-Governor stood, and the members of the Council stood with him, while his Excellency said: I have no doubt that all the gentlemen of the Council know the very sad news we have received this morning of the death of the Speaker of the House of Keys. The Island has sustained the loss of a very distinguished public servant, and we have all lost a very near and dear friend. I am sure that the Council will wish to show their sympathy with the House of Keys in the great loss they have sustained, as well as the general loss which the Speaker's death has inflicted upon this Island. Therefore, I propose to adjourn the Council out of respect to the late distinguished Speaker. In the House of Keys, MrJ. R. Kerruish took the chair, and there were also present Messrs W. H. E itto, E. Callister, R. S. Corlett, E. J. Curphey, A. Christian, W. C. Southward, S. Walker Anderson, J. W. Walton, W. F. Cowell, W. Christian, A. Qualtrough, T. F. Quine, A. H. Teare, M. Canine, J. Garside, and J. Cunningham. Capt. Kitto, at the conclusion of prayers, rose and said: Mr Acting-Speaker, in view of the sad new we have received this morning of the death of our esteemed Speaker, Mr Maitland, I move that out of respect to his memory this House do now adjourn to this day week.